When you awaken to the dimensions of the spirit you will be allocated a spirit guide/teacher to aid you through your awakening into this level of consciousness. The Spirit Guide/Teacher that you are allocated is entirely dependant upon the spirit realm to which you are born. There are many humans on Earth that have Clairvoyance of Spirit, the ability to communicate with the spirits of humans that have passed on Earth. Many can speak to the loved ones of Humans that have passed and send messages, However these Mediums will report communing only with Human Spirits. 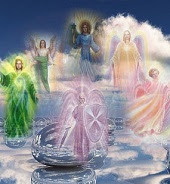 This is due to these mediums decending from the spiritual realms of earth humans, therefore their gifts can only reach through to the human realms where they can speak to humans who have passed. Now imagine other planets in the universe where extraterrestrials reside. Each ET that passes from each of those planets will enter a spiritual realm of their shared birth, and ET’s with spiritual clairvoyance will see and converse with ET’s from their specific realms. Imagine again where a group of different Extraterrestrial Spirits on a group of different planets share a communal lifestyle together, including other species in their physical lives. Imagine the Spiritual Realm they descend from. It would be shared. Different Species, mixed in one spiritual realm. A Medium or Clairvoyant would have the ability to commune with all the different spirits of different forms in this realm. Now we can imagine starseeds. There are many starseeds that are emissaries from different races. If it comes to pass that these Starseeds awaken Spiritual Clairvoyance they will “not” see human spirits. They will see the spirits of those from the spiritual realm that they are born from. Extraterrestrial Spirits. You will awaken to the Spirit Realm you are born from. Many Starseeds are of different ET species or ET groups and this will determine what they see and experience. This is why so many report different experiences. Some Clairvoyants may rule out others experiences as false because they do not match their own however they are likely mistaken. If they do not match it is likely because others are experiencing different realms of spirit. Although there are many differences in spiritual realms it seems as though Spirit/Guides and teachers share a basic fundamental pattern in the types of guides and teachings. The following is a basic outline to Spirit Guides and their functions. Every individual on the earth plane has a “Personal Guide” from a higher dimension that stays with them throughout their incarnate life, and is there to help guide them through the hazards of everyday living. They can only be seen by clairvoyant sight, but often their presence can be felt quite strongly, particularly in times of stress. Unlike many people, your Personal Guide will never leave you, regardless of how you behave in life, and are specifically chosen because there is an affinity between you both that is helpful for your present incarnation. They will not be a Personal Guide to anyone else, and are totally committed to your emotional welfare. If you request them for help in personal issues, you may be amazed how you’re suddenly ‘impressed’ with solutions to what may have seemed an impossible situation, or perhaps find the answers to confusing questions in your dreams. Although our friends and relatives that have recently died live on this plane, and will move close at certain times in life, they would not be your Personal Guide, as this guide will have been with you since birth. The Personal Guide will not reincarnate until the person they are looking after has passed from the physical world. Sometimes, such a rapport has built up between the two that, in rare cases, a decision is made to stay together when the Personal Guide chooses to reincarnate. Thus the roles are reversed and the previous guide incarnates on the physical plane with their counterpart as their own Personal Guide. Every person also has a Keeper with them throughout life, although only at specific times. They are more specialised than personal guides. Clairvoyants often see them as warriors, and their function is to protect our subconscious mind. When doing any form of spiritual work we open up to emotional experiences beyond the physical plane. The Keeper job is to open the “door” to our mind; to protect us from unwanted interference while we work; and close it after we have finished. This allows easy return to our earthly life, and prevents unnecessary loss of energy. It is essential that we ask for help from our keepers for, like our guides, they will not action without our permission. Both our Personal Guides and Keepers are totally dedicated to our personal welfare. They are capable of traversing dimensions extremely close to the physical plane, therefore it is relatively easy for us to become aware of their presence. They are there to assist not to frighten us. They are not “apparitions”, and certainly will never “appear” as spooks in the night! Only if we make it known that we are willing, will they find ways of letting us know they are there. These Guides are far more advanced than previous guides, and not interested in personality issues. They are involved with the development of the Soul, and are known as “Masters”. In that sense, they are there to help the individual, but only join us when the soul awakens to “itself”. They have infinite knowledge, and are of extreme value in guiding us on the Right Path, as we strive for greater understanding of our Soul direction and destiny in our present life. Each of us has a Soul Guide which is extremely important, for they stand near the centre of the “heart” of ourselves. They are the mediating force between the person we know as “Me” in our everyday life (the personality), and the Soul that we are, in the much higher sense. When a Guide reaches this stage, they do not reincarnate, except for the purpose of aiding humanity. The Soul Guide is interested in developing moral values, and it is their job to help us make the transition from the self-centred, emotionally reactive individual, to the “soul conscious” dedicated Disciple on the road to enlightenment. But they can only begin to do this when we start to recognise that there is more to us than just the personality, and there is a much greater “inner world” that we wish to explore. When we urgently strive for “higher knowledge”, the appropriate Guide will step forward to help us, and we will find that events and circumstances – like the “right” book, or “course of instruction” – will appear almost magically before us, which will herald the first step on our road to self-discovery. And once the Disciple becomes more advanced, they will be able to make their own personal connection with their Soul Guide, who will continue to train them in the deeper mysteries of other worlds. Although the Soul Guide takes on individual tuition, they will also be responsible for the development of other souls. Regardless of this, they will still maintain close interest until the time comes for their student to move on further, and another more advanced Guide will take their place. They never get involved in “personal issues”, although they do monitor the Disciple’s reactions to these experiences, and determine their usefulness to the development of the soul. However, if the student, inspite of their studies, is unwilling or unable to work towards raising their consciousness, and steadfastly remains locked in issues of pride, petty resentments, or over reactive behaviour to life events, then the Soul Guide – unlike our personal guides and doorkeepers – will step away from the individual and wait for a more opportune time to continue with their training. Whilst examining this area, we first need to understand that at this level the Guides are extremely ethereal, exceptionally highly advanced and are known as the Ascended Masters. Just as in every physical plane situation, whether in the family, the work place or in the political arena, there are always those who command deep respect and lead the way, so the same applies as we climb the Dimensional Hierarchy. As human beings, however, we are always open to making mistakes, but this Hierarchy are the Observers and Masters of all the worlds, and their comprehension of the Cosmic Plan is far beyond our personal reasoning. These Sacred Guides are the “Sages” of the Inner Worlds, who have long since become “Adepts” of the lower levels, and have no further need for incarnation on the physical plane.They are known as the Ascended Masters, and indeed, they have earned the right to ascend to the highest levels, but have chosen to remain in their present position in order to support and aid those who are following in their footsteps. It is not surprising therefore, that their concentration is not on individuals, but the soul development of the whole of humanity.